With Home Sharing, you can stream content from any Mac or PC to your iPad directly. You simply set up Home Sharing on your iPad, turn on the feature in iTunes on your computer, and you’re good to go. Click the File menu and choose Turn On Home Sharing. The Home Sharing dialog appears. Enter your Apple ID and password and then click Create Home Share. A message appears, telling you to use the same account you just signed in to on devices you want to share with. 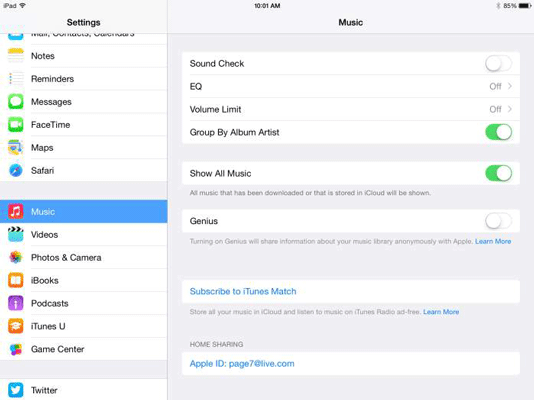 On your iPad, tap Settings and then tap Music. In the Home Sharing section, enter your Apple ID for the same account you used in iTunes on your computer and, beneath the ID, enter a password. Tap the Home button and then tap Music. Tap Songs and then tap a shared song to download it from the cloud. To view shared videos, follow the same procedure for Videos settings and the Videos app.